A guide to inspire and motivate you to learn Excel. The Excel Guide you need! Excel has made my life simple and I wrote this ebook hoping the challenges I faced starting with Excel become a fun learning for you! Start itself must never be a challenge! A lot is left undone just because there is no one to guide from where to start! For me… best way to make anyone excel at anything is by making the start “challengeless”. And this is exactly I am hoping to achieve with this book to help you understand what Excel can do leaving you inspired to learn more! Simply subscribe to my newsletter that covers Excel in great detail and let you download this book for free. PakAccountants is not a new place for me as I studied ACCA myself. I had a taste of his teaching and know how detailed he is and he carried the same over to Excel. The effort Hasaan has put into this website over the years to give one place for everything to every business student out there speaks for itself. Thank you for giving us the best website for everything accounting and Excel. Hasaan’s Excel tutorials are one of the best I have come across. The images he use in his tutorial to explain each step helped me immensely in understanding Excel’s advanced tools. Being an avid reader of Excel to Excel blog I can vouch for tips he shared in this free book that one actually needs and applies. Thank you for everything you did for Excel Learners and I know future is even better. 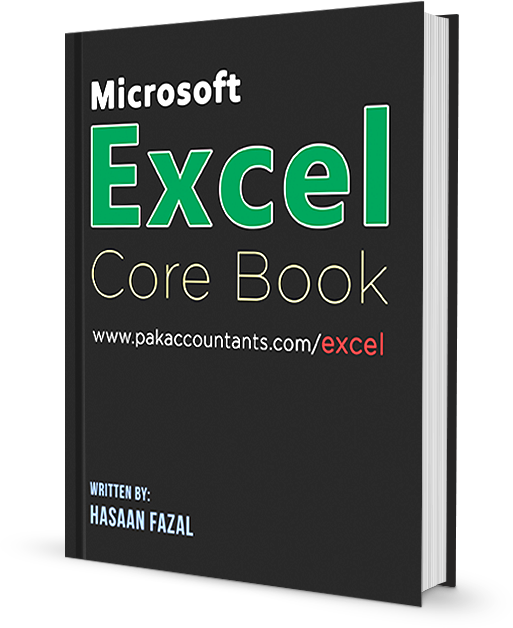 Excel Core Book is written with one aim in mind and that is to inspire new users about Excel. Once they know the basics and stuff Excel can do you will be more than willing to learn and use Excel more in your daily life. Introduction to Excel and labeled diagram of default screen that users see when they launch Excel. 35 practical tips explained in detail with pictures to help you understand how to get the best of tricks mentioned. Links to several detailed tutorials that will further your Excel knowledge and make you skillful. List of widely used shortcuts that are easy to remember as well. Main tools in home tab that require your attention. Understanding clipboard paste special with explanation different unusual things paste special can do that are unbecoming of “paste”. Detailed introduction of custom number formatting. One of my favourite tools in Excel that goes beyond formatting. Understanding the difference between conditional formatting and custom formatting in Excel. How to use sort tool in detail that is exclusive to this book. Working with fill tool to automate the data entry process. Harnessing the power of Find and Replace tool that is unique to Excel that goes beyond cell value into formulas. Understanding GoTo Special tool with explanation of hectic tasks that this tool can perform in click of a button.